A mouthful not only in the title of this one, but a delicious mouthful when biting into this mammoth of a burger. There are always different ways to serve up burgers, and for the last year or so I have been going with the smashed burger route on a large cast iron skillet. I’ve said it before, but anytime I ask my kids what they would like to eat, the oldest always shouts out ‘burgers’. As my wife had other plans to help out with her parents this past weekend, I decided to opt-in on the burger suggestion as it was only going to be me and my son hanging out that night. So, as I went to the store to shop for the ingredients, I decided that I would get some nice rolls from the bakery. I was going to buy two of these awesome butter top buns that are just perfect when holding up to big, juicy burgers, but then something grabbed my attention; the asiago jalapeno bagel. I’ve never thought of using a bagel as the bun, but now after experimenting with it, I’m sold. Now you can go any direction with your burger, whether plain, cheese, onions, etc, but I thought this one worked out well. Start by forming your patty and season both sides generously with salt and pepper. While those rest, prepare the rest of your ingredients, as well as get your charcoal lit for your grill. If you are not using charcoal, then use your gas grill, or stove and large skillet. Again, no preference here. Once your grill is nice and hot, add the burger. Cook to your desired temperature (I prefer medium with a bit of warm pink in the center), but when you flip, add the American cheese to get it nice and melted. I also place the onion on the grill for a few minutes, as well as the asiago jalapeno bagel to warm those through. Now I stated brown gravy. If you don’t have any, don’t worry (but it did give a nice, additional flavor to this burger. I only used it because I had some leftover from making my poutine potato skins. Take the bottom part of your bagel and smear the warm brown gravy onto it. Add the sliced red onion, the bacon, the burger, the lettuce, and then a couple of pickles. Top with the top of the bagel, press down, then get into this thing. I was blown away with every bite. 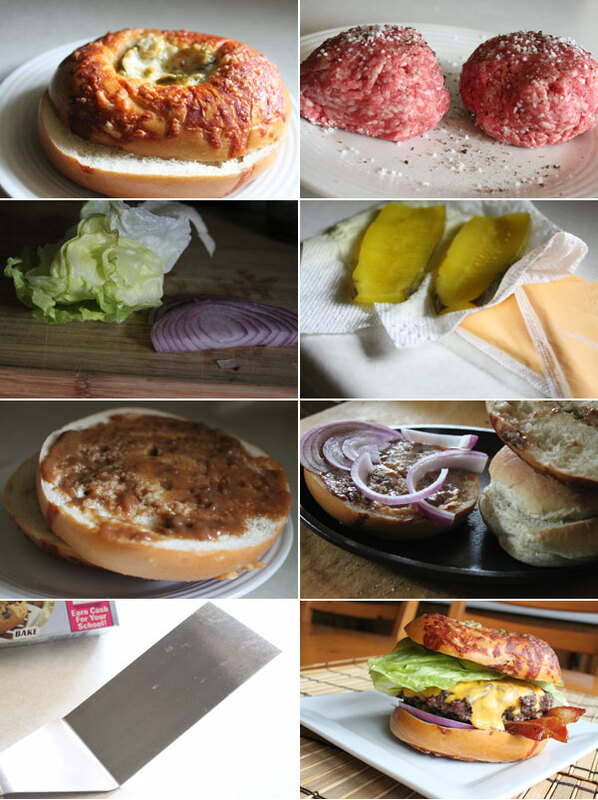 The bagel in itself was exceptionally good, but the combination of all of this, along with some of that mild bite from the jalapeno, just made this one of my favorite burgers. I’ve made enough in my time, but seriously this is up there as being on of my top favorites. 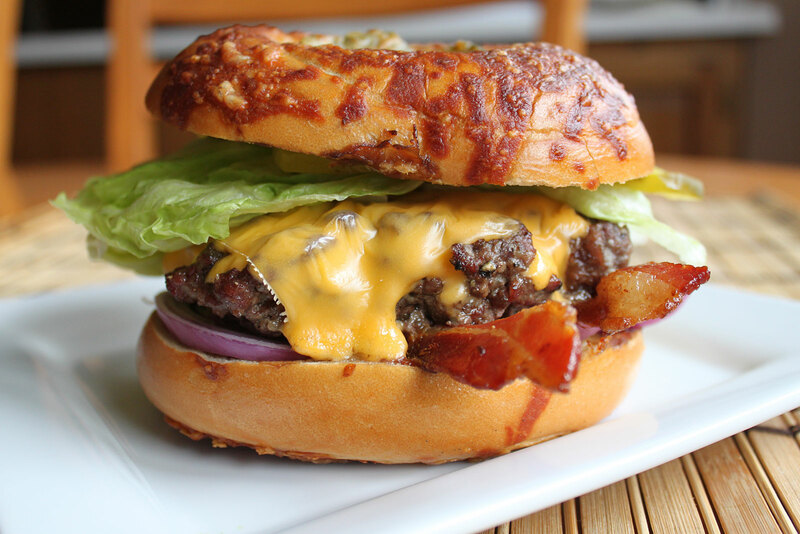 So the next time you are cooking burgers, think of the bagel as the bun. It was a real game changer. I hope you enjoy!